DONESTK, Ukraine -- Mention a cyborg to a Ukrainian these days and they probably won't think of "cybernetic organisms", or man-machines of science fiction. 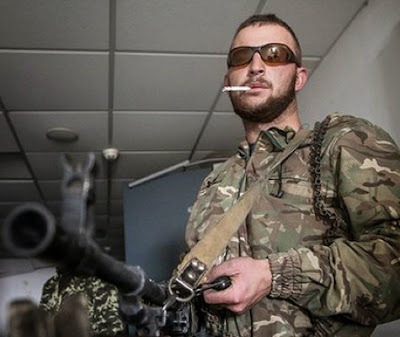 After months of fighting rebels, the soldiers at Donetsk airport are viewed by Ukrainians as superhuman. Instead, the word now conjures up images of rugged, heavily armed men holed up inside what remains of Donetsk Airport in war-torn eastern Ukraine. The airport has become a symbol of Ukraine's fight against separatists, and the "cyborgs" are Ukrainians who have held on to it despite persistent rebel attack. The nickname was first used online and has since become a media staple in Ukraine. It stuck, because to some the Donetsk airport defenders' exploits have appeared superhuman. The separatists have been trying to capture the airport since May, allegedly with backing from the Russian military. Even though a ceasefire was declared in early September, the airport remains a scene of fierce fighting almost every day. It is located on the northern edge of Donetsk, eastern Ukraine's biggest city and a key rebel stronghold, which separatists use as a springboard for their attacks. And against this backdrop of violence, the pro-Russian rebels are to hold elections on 2 November, in this region and in rebel-held areas of neighbouring Luhansk, in defiance of Ukraine, but with the support of the government in Moscow. The airport is sandwiched between the Ukrainian and separatist-controlled zones, which means that surrounding it and cutting off supplies completely is difficult. Built only a couple of years ago, ahead of the Euro 2012 football championships co-hosted by Ukraine and Poland, the airport is estimated to have cost around $860m (£537m; €685m). But now the glittering showcase has been reduced to a heap of twisted metal, and its runway is littered with burnt-out tanks and shattered airliners. Rebels are very close to the main terminal building and have even entered some of its floors. The Ukrainians, however, are holding out on others. So far, this has been enough to keep the separatists at bay. It is not clear how many people on either side have died in the fighting for the airport; retrieving the bodies is so dangerous that some are reportedly left to lie among the debris. So why are both sides so determined for control over the airport? Clearly it would allow munitions, hardware and manpower to be airlifted into the conflict zone. But, given its current sorry state, it is going to be a while before the airport is able to handle flights. For now, its significance is as symbolic as it is practical. In addition to deliveries from the army, the airport's embattled defenders receive many of their supplies from Ukraine's volunteer movement. President Petro Poroshenko himself donated some night-vision goggles. But behind the media image of the cyborgs, there is a grim reality to the soldiers' lives. Some of the Ukrainian fighters inside the ruins of the airport have taken to social media to describe what it is like being there. "It's cold. It's dark. It's dangerous all the time. All this affects how you think. You get used to shots being fired pretty quickly," writes Maxim Muzyka. "You get used to everything," he adds. Just like civilians outside the conflict zone, the soldiers take selfies and post videos of what is going on around them. "Not everyone likes the name," says Vasily Holoveshchenko who paints a sobering picture of life at odds with the superhuman image they have been given. "We are humans. Almost every one of us is married with children. Our thoughts are human too - we want this to be over soon."